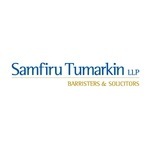 Samfiru Tumarkin LLP is a Toronto based employment law firm. The Toronto employment lawyers at Samfiru Tumarkin LLP offer services in legal areas that include: Labour & Employment Law For Employees, Labour & Employment Law For Employers, Personal Injury Law, and Commercial & Insurance Law. The team at Samfiru Tumarkin consist of a unique blend of lawyers, professionals and highly trained staff with expertise in litigation and dispute resolution. The employment lawyers provide practical and cost-effective solutions, backed up by years of proven results and countless testimonials. They have appeared before all levels of courts and administrative tribunals throughout the province of Ontario, including the Ontario Court of Appeal. Because their highest priority is to provide client-oriented service, Samfiru Tumarkin LLP is committed to responding immediately to client emails and phone calls, moving matters forward in a timely manner, and achieving results.